In my last post, I mentioned Nike's "Just Do It" slogan. I find myself repeating that and other sports slogans to myself during my runs. On some of my more difficult runs, I often ask myself: "Is it in you?" 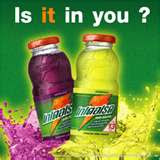 (Gatorade) Apparently those marketing people know what they are doing. At least when it comes to motivation. I don't buy Gatorade because it will magically make the answer "yes, yes, yes" when I ask myself that question (although I do buy Gatorade, or G, or whatever they want us to call it). However, I'm sorry Nike, but I don't have any of your shoes. I think I might have a long sleeved shirt that is yours, but it is buried until blissfully cooler days are upon us. The fact that telling myself these things actually motivates me means so much of succeeding at it really is mental. So what words motivate you? I heart creative marketing slogans.. The Saucony people rock at their ads, just check out the website, very cool!! I am an extrememly self motivated person.. Often the words "Go Faster Mel" are echoed in my mind. Oh quotes, there are too too many to list. FYI Giveaway on the old Blogger today. FYi I may just be telling people about your 17 mile treadmill run next week, if you don't mind. I am still AMAZED at that..
Ha! I thought about you and your 17 mile treadmill run this week. I, like Mel, am still in shock. I did 4 at the Y this week and the entire time I was thinking, "JUST 4...Candice did 17!" I think I pondered that for 4 miles! And Mel, I thought about you yesterday on my run when I was speeding up to pass anyone in front of me. It was quite silly mainly because they were older people with their walking sticks, just walking. But still, something about having someone in front of you to speed you up. Then you pick out your next passing victim! Thanks for the motivation-these blogs motivate me! "Be the deer" - I have no clue why. I love John Binghams booktitle 'No need for speed,' and I often mumble it while I'm running.